The X-Men, mutant heroes sworn to defend a world that hates and fears them, are back! This time, with the help of new recruits The Beast and Angel, they must face evolution itself in the form of their former teammate, Jean Grey. Possessed with the cosmic power of the Dark Phoenix, the resurrected Jean Grey has become a danger to herself, her mutant comrades, and the entire planet. To stave off this imminent threat to humanity, a potential cure is discovered and processed to treat -- and ultimately eliminate -- genetic mutations, once and for all. 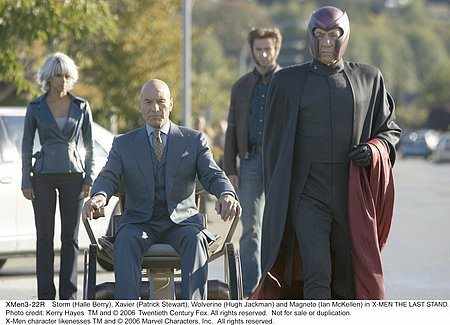 Now, as the battle lines are drawn, the X-Men, led by Professor Charles Xavier, must contend with both Jean Grey's world-consuming powers, as well as the malevolent Brotherhood, a band of powerful mutants organized under Xavier's former ally, Magneto. 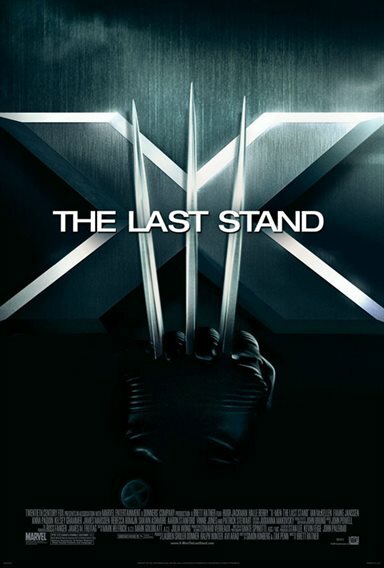 Download X-Men: The Last Stand in Digital HD from the iTunes store. 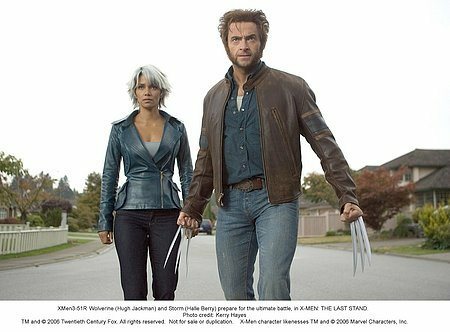 X-Men: The Last Stand images are © 20th Century Fox. All Rights Reserved. 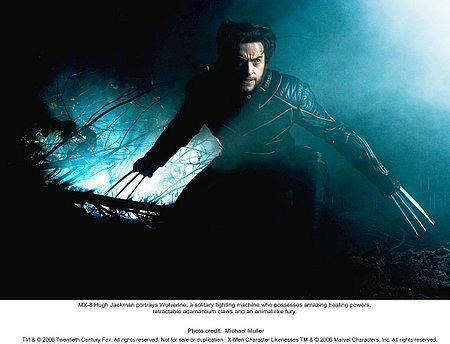 Of all the powers of all the mutants in the X-men series, perhaps the most powerful of all would be the ability to make Kelsey Grammer look cool as Beast. 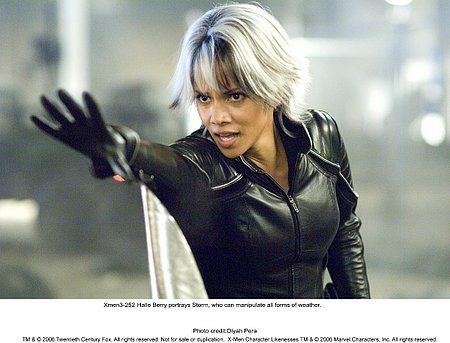 It turns out the film makers don't have that power, but they do a decent of job of wrapping up the X-men trilogy in the action-packed X-Men 3: The Last Stand. 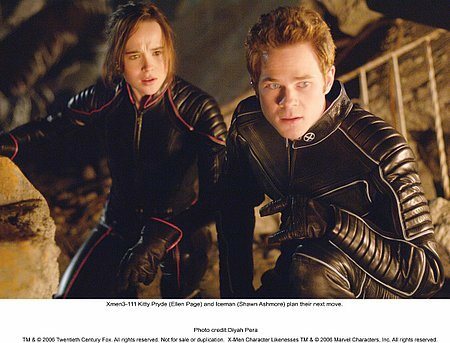 The story picks up where X2: Xmen United left us, Jean Gray is supposedly dead, the president is on the side of the X-Men and all is normal at the Mansion (if you call normal partaking in ultra cool battle simulations with our favorite X-men that we are treated to in the first few moments of them film). A new main character, Mutant/Human Relations liaison, Beast (Kelsey Grammer who looks like a big, blue, hairy Fraiser Craine because after all he is a big, blue, hairy Frasier Craine…and really, he looks ridiculous strutting around in his suit and tie) learns that the government has secretly developed an antidote to the mutant X gene. 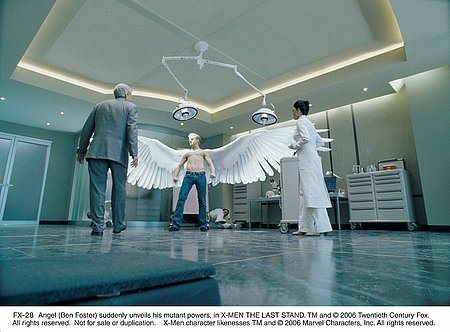 Any mutant who takes the antidote will loose their mutant abilities and become a regular human. For no reason other than to set up one of the movies jaw dropping effects involving the Golden Gate bridge, the government sets up its laboratory on Alcatraz Island which houses the origin of the antidote – a boy mutant who's power is to cure other mutants of their mutations just by being around them. Why the boy's power doesn't work on himself to cure him of his own mutation is never explained but hey those kind of paradoxical scenarios have no place in the comics. Do they? By extracting and synthesizing his DNA the government is able to create the antidote which they plan to give on a voluntary basis to any mutant who chooses so. The Government (being the government) has secretly weaponized the antidote and armed plastic guns (guess who can't control these) with it. 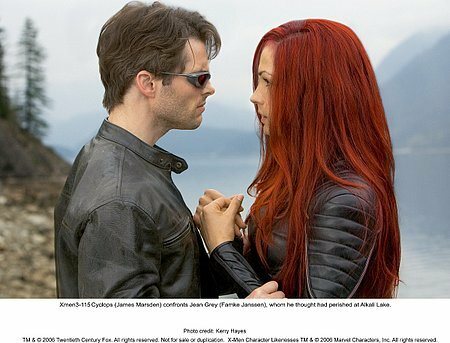 Meanwhile, Cyclops is drawn back to Alkali Lake by the constant voices in his head of Jean Gray. After shooting his eye beam into the lake to quiet the voices Jean rises, more powerful than before, as the Phoenix and proceeds to seemingly kill Cyclops. How and why she is able to come back is not fully explained, perhaps the filmmakers decided to leave that story to the comics, but the uninitiated might be scratching their heads as to what is going on. 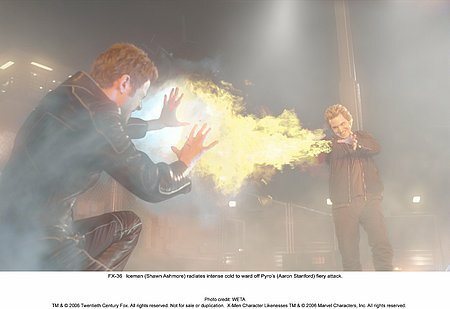 As it turns out Phoenix is the all powerful dual personality of Jean that has been suppressed for years by Xavier. Knowing all too well that unleashing her full potential would be catastrophic to herself and the world, Xavier has made the choice to keep Phoenix at bay. Magneto, as seems to be his custom, sees the opposite of Xavier in Jean/Phoenix seeking to employee her limitless powers to his brotherhood of evil mutants as his weapon in the final battle of those who wish to see the mutant race extinguished from the earth. "They wish to cure us…well I say We are The Cure!" becomes Magento's rallying call to a band of cool new evil mutants to which we are introduced. Overall the movie is way to short; not stopping to explain enough of what is driving the action on screen leaving those unfamiliar with the comics with one big action sequence after another. Though the action is superb there are some particularly silly subplots including Rouges jealousy over the relationship of Iceman and Kitty Pride, and the whole Angel story. Both are unnecessary and steal away screen time form the main plot which is not fleshed out enough for the average viewer. Hugh Jackman once again gives a great performance as Wolverine and sets up his character nicely for what is sure to be a spin-off Wolverine series. 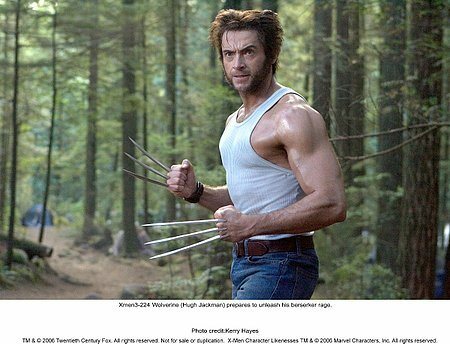 Wolverine comes off as the only character we seem to care about, and one of the few who survives. Not without its flaws X-Men: The Last stand is a worthy effort and a fitting closing to an exceptional series. Despite Beast. 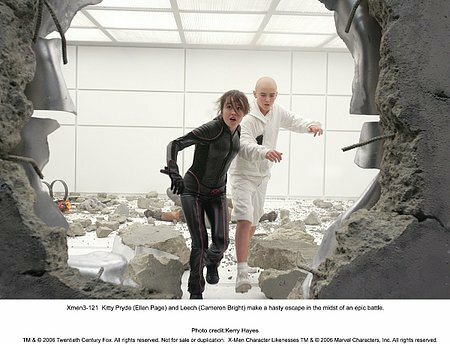 X-Men: The Last Stand images © 20th Century Fox. All Rights Reserved.